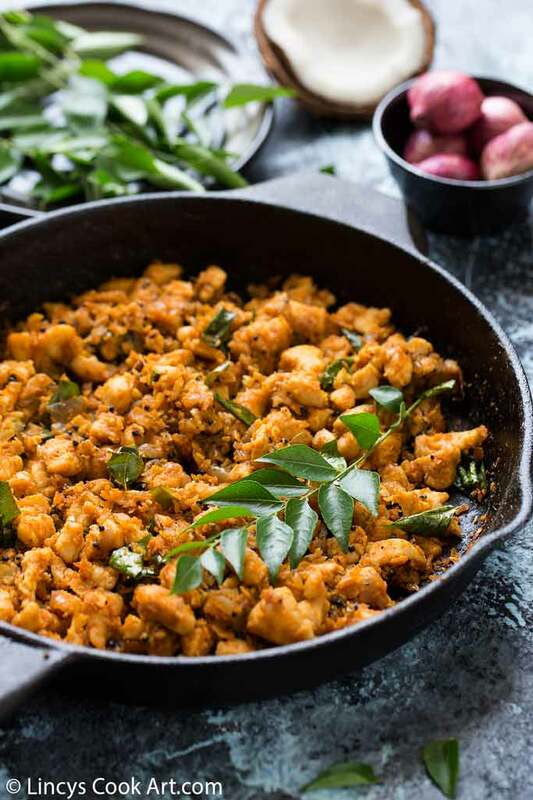 Chicken Thoran| Chicken Peera| Chicken Stir fry with coconut recipe is an easy to make tasty Nadan Kerala preparation which I, normally end up preparing whenever I run out of time to prepare a non vegetarian dish. Very limited ingredients and simple cooking procedures make this dish absolutely easy and quick. The taste of the dish is unbelievable it goes well with almost everything. Here I have served it with plain steamed rice with rasam and kappa puzhukku combination. It tastes really divine. 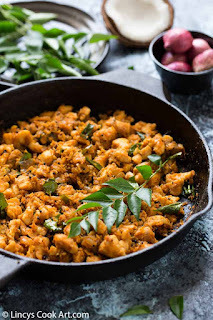 I have shared many Chicken Recipes with you, this is a pure Kerala style chicken recipe. This is also one such authentic Kerala preparation that would make everyone drool! Simple delicious preparation which suits every occasion and best for the quick week end brunch or dinner. I prefer chicken than red meat in all week ends as it is less in fat and high in protein. Do try this quick recipe and make your family members happy!!! 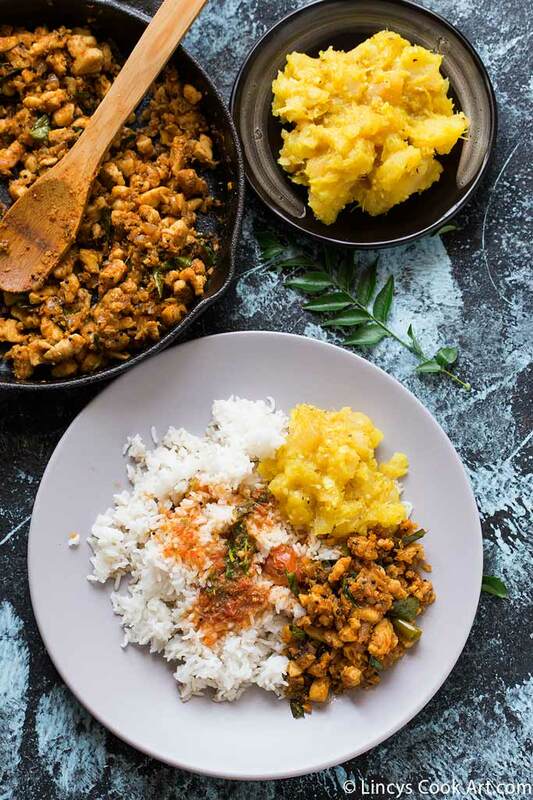 Wash the chicken thoroughly and finely chop them.You could use chicken mince or you could finely chop and then keep inside the blender jar/ food processor and grind to make a paste. Heat oil in a pan and mustard seeds, once it splutters add the onion, green chillies, ginger, garlic, curry leaves with a pinch of salt. Allow to cook till it starts to become soft and then slightly golden for a minute or two. Now add the chopped chicken, turmeric powder and add some salt. Allow to cook well, now water from the chicken oozes out. If you are not using chicken breast at this stage close with a lid and cook till the chicken cooks soft. Now stir constantly and cook in medium flame so that the water evaporates out fast. Slightly crush the coconut, chilli powder, fennel powder and garam masala by pulsing once in a blender (do not grind it). 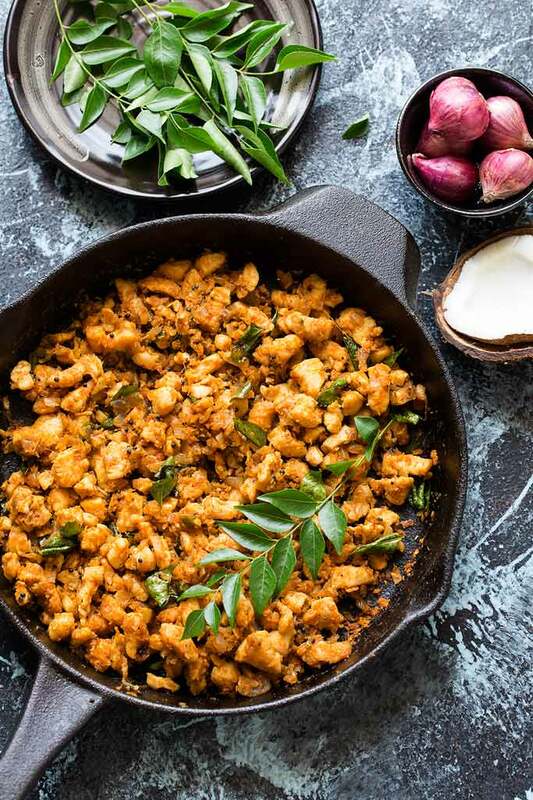 Now add the grated coconut mixture with some fresh curry leaves and mix well and cook for further 2-3 minutes on medium flame and by constant stirring to dry out the moisture slightly and switch off the flame. 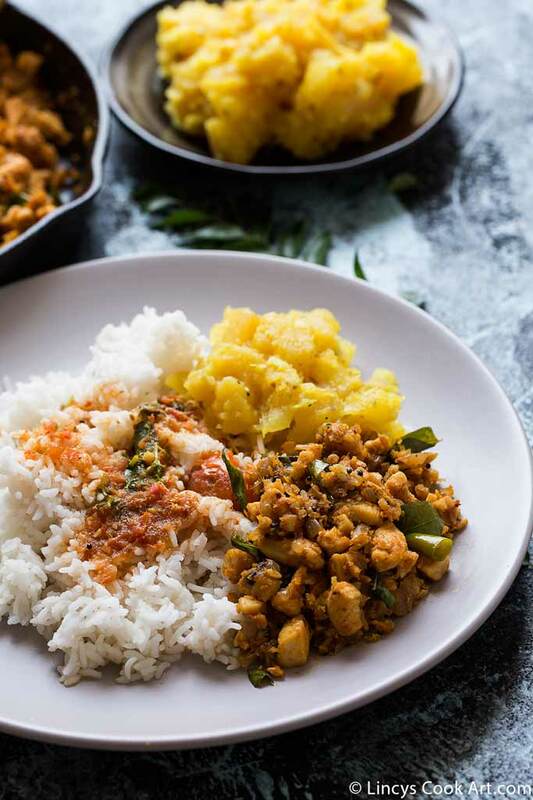 Serve with steamed rice and rasam or dhal and kappa puzhukku combination. Here i have used 2 chicken breasts and doubled the quantity. You could replace chilli powder with pepper powder if you wish. You could make this recipe using chicken with bone pieces too but you have to cover it and cook it long till it becomes soft. 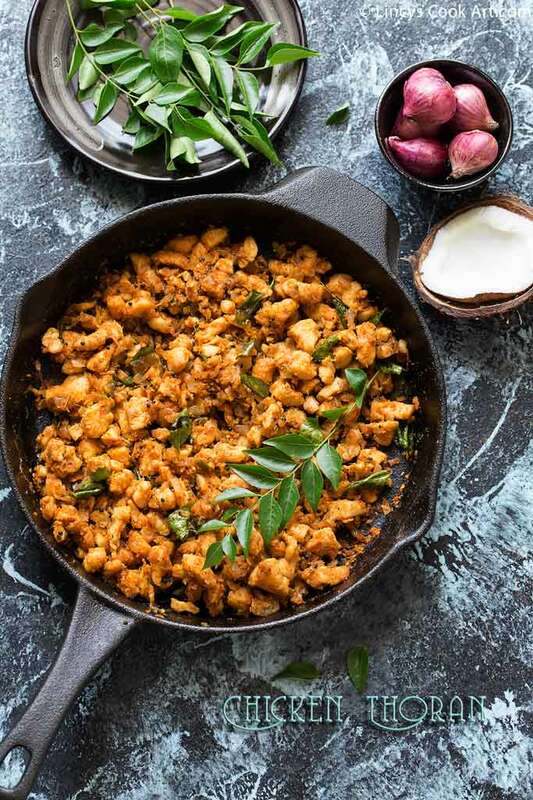 Boneless chicken or mince you could make thoran in no time.